Classy, sophisticated and exotic, it evokes memories of paradise in the tropics, bronze skin, white sand and turquoise waters. 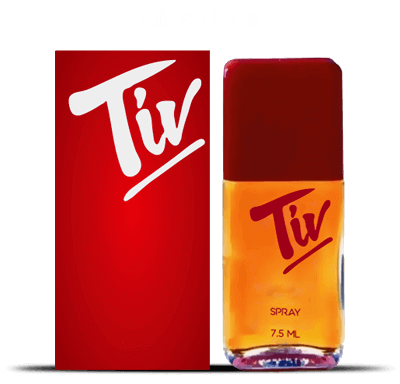 TIV Designer Perfume for women is the fragrance of the Caribbean. Tiv comes as an Eau de Parfum Spray, Eau de Toilette Body Spray, and a perfume body powder spray. The essence of TIV Designer Perfume remains a unique tapestry of gentle floral impressions. Jasmine, Italian and Rose Bulgarian, with shades of Myrrh and Olibanum from Africa, woven through like golden threads joining the whisper of an ocean breeze, the mysterious aura of the Orient, and the haunting memory of a tropical garden. Tiv is the best perfume for women looking for a sophisticated and sultry scent that triggers sensual emotions reminiscent of the tropics. I met my future husband 35 years ago, wearing TIV on our first date. Over the years he has always said it was the “fragrance” that reeled him in. LOL Thank you Cynthia. We celebrated the anniversary of our first date on April 28, 2017, in NYC at a Diana Ross concert, We are now enjoying Classic TIV together as we prepare to celebrate our 30th wedding anniversary. During our memorable trip to Paradise Island, my wife discovered and fell in love with TIV. She has been asked many times where to get it. I’m sure all your customers have similar stories. Good luck, if you need marketing/promotional help let me know. Joan T. – Washington D.C.
My wife and I found TIV in Nassau years ago and ever since it has been my favorite perfume. When she wears it, she always gets remarks about how good she smells. It is also one of my wife’s favorites. It stays on all day and she enjoys the attention. It is the perfume she always grabs when we have any special occasions. We totally love TIV perfume. I worked for Marriott International some time ago. I purchased Tiv in the Gift Shop at our Corporate Headquarters. I loved it so much, better than anything I had used before. When I ran out and tried to buy more, I learned that the store no longer carried it. I searched all the stores in the area but couldn’t find it anywhere. I then went to the internet and used a search engine to investigate. I didn’t find a store, but I found you. My best wishes.